I live in New Hampshire, which is the home of winter. Recently, spring appeared and shocked everyone. To celebrate, I went on a Memorial Day trip with a few friends along the Greenway, a 54-mile trail through Western NH that I’m entirely too fond of. I was a little nervous starting out. We planned some big days and I am certainly not in the shape I was when I thru-hiked. The weather was ominously in the 40s as we set out, and the wind was cold. 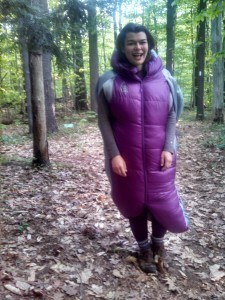 I knew I would need a warm sleeping bag that wouldn’t take a toll on my back and knees, so I decided to put the Sierra Designs Mobile Mummy to the test. Best Feature: Arm-holes in the side allow you to move around more easily while a double baffle system keeps out the cold air. Yes, the looking ridiculous part. My husband calls me The Starfish when I sleep. In other words, I tend to spread out. 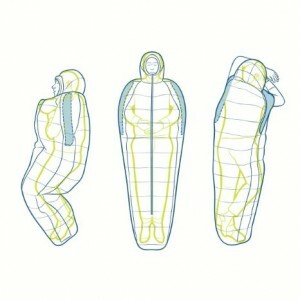 Sleeping bags have always frustrated me because of how my arms feel like they are pinned to my side or letting in cold air. I really loved the arm feature of the mobile mummy, not to mention the way that it zips up and rolls with you no matter where you go. The baffling creates a solid seal for warmth, too. Even on cold nights I could still stick my arms out of the bag and take over my husband’s side of the tent. Despite the fact that this bag made me look like an obese caterpillar, I did find myself wearing it around often. It’s ideal for sitting in a shelter and reading, eating, or writing in the trail log when it’s just too cold to get out of your bag (if you ever take a shelter zero due to rain or snow, this is the bag to have). It would also be the perfect bag to bring on a sunrise hike so you can stay warm while waiting at the top of the mountain. It does have its limitations as a vest: the foot box rolls up and attaches to your back, but it can be a little awkward to actually walk around. 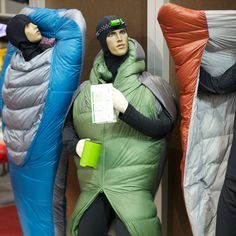 I would be comfortable using this at camp in lieu of a down jacket during most 3-season weather, although it wouldn’t be totally ideal in the late fall/early spring. This bag was incredibly warm – even when I had my arms out of it. The baffles work much better than I expected (almost bafflingly so). The hooded part was snug and the whole bag is well fitted, so no cold air snuck in. This bag retained my body heat better than any other I’ve used before. Note: I also took this bag with me this winter when I skied into Zealand hut. 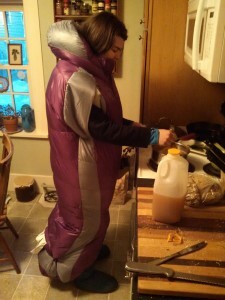 It was obviously way too cold (-20 F) for the temperature rating, so I used another sleeping bag over it. I think I was the only person that night that slept well. For the record, I credit my warmth to the airtight design of the Mobile Mummy that still let me move around and adjust the outer bag. This bag is made with ‘dri-down’, which is down that has been treated by a polymer that makes it resistant to water. 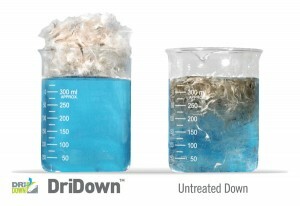 Compared with regular down, dri-down stays dry 10 times longer, retains its loft 2.7 times longer, and dries out 33% faster once wet. I haven’t put my dri-down to the test on waterproofness. We’ve had a dry Spring here, so we stayed rain free for the trip this weekend. I will be updating this post as I go through the summer to let people know how it’s holding up for me. Overall, this sleeping bag is streamlined to be exactly what it is: a wearable, fast drying, lightweight luxury bag. A note on sizing – This is a fitted bag, so when the specs say the upper limit for the bag is 5’8”, it really does mean 5’8” is the maximum. Even at 5’4”, I felt a little restricted when I tried to extend my toes. If I were actually 5’8”, I think I would get the men’s regular instead (which has an upper limit of 6’). Of course everything looks better on a model. Value: This bag is expensive, but dri-down comes at a high price. To be perfectly honest, I do think it is worth it for the right person. If you are extremely weight conscious, or if you don’t feel that your sleeping bag can be restrictive, or if you are not the sort of hiker who lingers in their sleeping bag, this might not be the right choice for you. You can find lighter, cheaper bags with fewer frills. 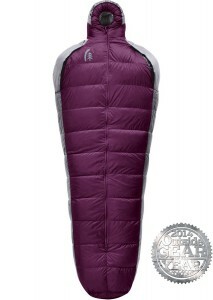 But, if you are the kind of backpacker who prioritizes a really good night of sleep, this is a very light bag given the degree of comfort it offers. I plan to use it a lot this summer and, not being as weight-conscious (or fashion-conscious) as my contemporaries, I plan to bring it with me on my next long distance adventure. I might look like a caterpillar, but I’ll feel like a starfish. Thanks for the review. Looking for a new bag and came across this one. I hate feeling restricted in my current mummy bag. Definitely my top pick.